After three generations of Parminters have run the butchers shop on The Green at Haddenham, the business is now up for sale. Simon Parminter and his wife Margot intend to retire to Hereford once the premises are sold. Their home, and the shop attached to it, are up for sale. Mr Parminter, 59, said: “I am having trouble with one of my knees, and I am the right age to do this. “We want to have a good retirement and be able to do things. 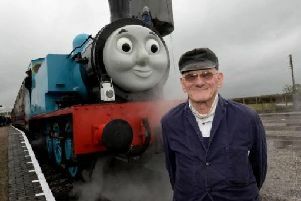 Mr Parminter says he will work as a volunteer with steam trains and indulge his love of drawing and painting. His father and grandfather opened the butchers shop in 1966 after moving from their premises in Aylesbury. Mr Parminter didn’t intend to follow the family tradition at first and worked as a chef for many years. But 25 years ago he decided to join the family business. There has been a butcher on the site since 1776 and the animals back then were slaughtered in the yard, but evidence of the first shop on the site does not appear until 1905. Mr Parminter said: “A lot of people will be devastated to see it go, but a lot won’t really worry. Mr and Mrs Parminter have one daughter, Zoe, who works as a scientific patent researcher in London. They have two fulltime employees, one of whom intends to retire and the other is looking for a new job.